Owners of surplus military bullets, factory seconds, or bullets pulled from loaded cartridges can rapidly repair most kinds of damage that occur to such projectiles, often resulting in an appearance and accuracy similar to new bullets. The first stage is a draw die to restore roundness to the shank. The second is a high pressure, precision ogive reshaping die to straighten the tip, push out dents and dings, square up the base and bring uneven core filling to a consistent level. 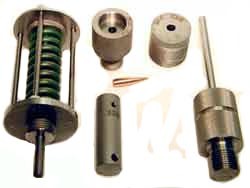 Since surplus and damaged bullets often can be purchased for a fraction of their original cost, processing them through the Corbin FX-1 "Fix Kit" can result in extremely high return on the investment. Because of the high precision alignment, stroke length, timing, spacing, and tremendous pressures involved, the kits are only available for Corbin's CSP-1, CSP-2, CSP-2H, and CHP-1 presses (the S-Press, Mega Mite, Hydro Junior, or Hydro Press). 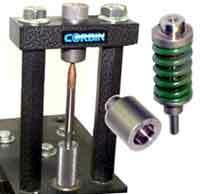 Any bullet from .142 to .458 can be processed using the Corbin FX-1-S kit, which fits the Corbin S-Press (Cat.No. CSP-1). 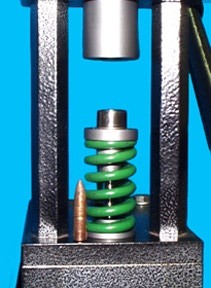 Calibers from .224 to 1-inch cannon can be processed using the FX-1-H kit, which fits the Corbin Hydro-Press and the Corbin Hydro Junior Press (both are power presses). The FX-1-H can be used in Corbin's huge 70-lb. 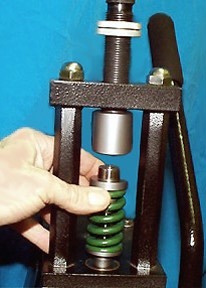 roller bearing hand press (The CSP-2 MegaMite) in calibers up to .475 (depending on the specific materials, length, and kind of damage). Bullets can also be expanded to a larger caliber, so long as it is within about .005-6 inches of the starting diameter. This makes it possible to turn damaged .308 bullets into excellent .311 diameter slugs for the .303 British Enfield rifle, or to reshape a full jacketed 5.56mm NATO bullet into a soft point spitzer by turning it backward (provided there is no steel insert within the bullet). Bullets such as the .50 BMG can be reclaimed and turned into reasonable hunting or target bullets. The shape can be modified, made sharper or more rounded, or flattened for use in tubular magazine rifles. In order to assure success, you must send a dozen sample bullets with the kind and amount of damage to be fixed. These will be used to test and adjust the kit's dies and punches. Each kit is individually made to solve the kind of problems found in your particular lot of bullets: delivery will vary depending on current work-load, from 30 to 90 days. A non-refundable deposit of 50% is required to begin work. Changes to the specifications of an order which are received after the order has been started may require a new order, depending on how far the work has progressed. To place an order, first contact Corbin and describe the caliber, the style of bullet, and the kind of repair to be done. 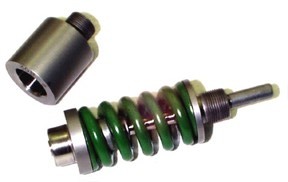 FX-1 kits can reshape and accurize bullets that might otherwise be scrap, in one or two strokes of the press (about 8-10 seconds per bullet including handling time). Some bullets may not be practical or safe to reform: bullets which have tracers, explosives, or incendiary compounds should never be reformed. Armor piercing bullets equipped with steel or carbide inserts may not respond to the reforming process, although often tip or base damage can be fixed without reshaping the over-all nose curve. Roundness can nearly always be fixed, even with solid copper or brass bullets. Another use for this style of die set is to form very sharp pointed spitzer bullets, either open or lead tip, or even FMJ style (depending on the strength and thickness of the jacket). 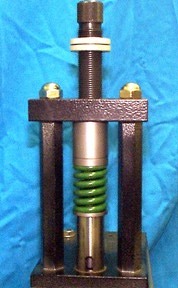 A special version with core swage and boattail core seater die, called the FX-2, is used to produce boattail base bullets without the step or rebate. A swaged core can be seated into a jacket, and then placed in the final two-piece FX die cavity to form the ogive and tip in one final stroke. 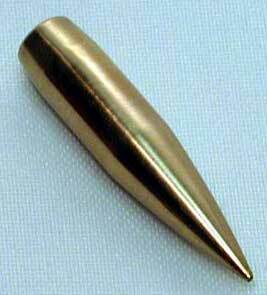 Typically, a point forming die (PF-1) and a lead tip shaping die (LT-1) are used to make small open tip bullets. 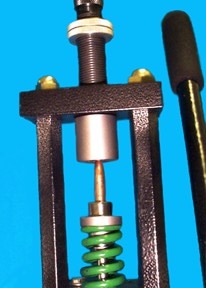 But the LT die cannot sharply point up the open tip, or close the tip as completely as the FX style two-part final die.